A regional daily saluted a sporting star of its patch after he helped secure a historic win for England in the football World Cup. The Sunderland Echo splashed today on goalkeeper Jordan Pickford’s heroic performance in last night’s round of 16 match against Colombia in Moscow. Pickford, who is originally from the Echo’s patch but now plies his trade on Merseyside with Everton, saved a penalty in the decisive shoot-out to help England progress. Earlier in the game, he had also produced an acrobatic save to deny a goalbound long-range shot. The Echo ran with the headline ‘Hand of Jord’, a reference to the infamous ‘Hand of God’ goal scored by Argentina’s Diego Maradona against England at the 1986 World Cup. 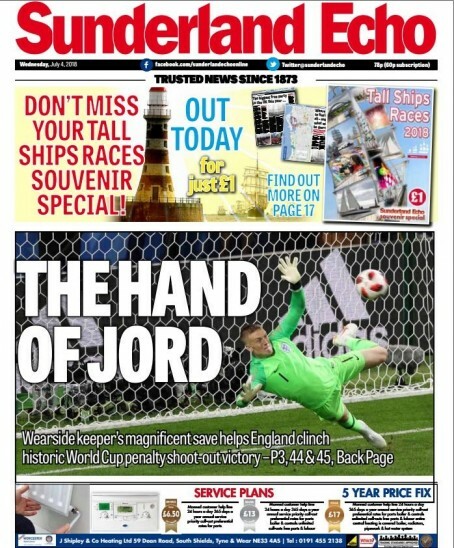 HTFP reported last month how the Echo had used its front page to wish luck to Pickford, and fellow Wearside native Jordan Henderson, in the tournament in Moscow. Henderson missed his penalty in the shoot-out yesterday, but successful conversions from Harry Kane, Marcus Rashford, Kieran Trippier and Eric Dier saw England through. Hopefully the story will also “save” the Echo!